The controversial German King Ludwig II had an ambitious plan to erect as many as seven castles in the picturesque Bavarian countryside. But his plan failed and the king left behind the impressive castles Neuschwanstein, Linderhof Castle and Herrenchiemsee. Rough plans of the palaces Falkenstein, Gothic Byzantine and Chinese Palace were also left. In the heart of Germany, however, is the original medieval Falkenstein Castle. Situated among the picturesque Harz Mountains, it is the peak of the German town Falkenstein. 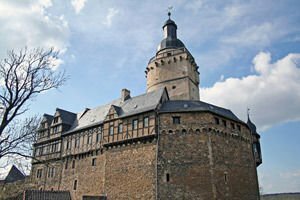 It is located between Aschersleben and Harzgerode. Falkenstein Castle dominates the Selke valley in the German province of Saxony-Anhalt. Falkenstein was built between 1120 and 1180 around 1120, during the reign of prince Henry of Anhalt, who was ruler of Anhalt Eike von Repgow from Reppichau who wrote here "Saxon Mirror" (Sachsenspiegel). This is the First Book of German law and it was Dedicated to his commissioner Hoyer von Falkenstein. In following centuries following the Falkenstein Castle has been repeatedly rebuilt by its owners. It also remains unstuffy, perhaps because of its commanding position, such as to resist any enemy attack, but in the 18th century the building awakes literally in ruins. Its next owner, however, restored much of the complex. And to this day Falkenstein holds the character of a medieval fortress. Even local legend remembers relation to the building of Falkenstein. The castle was built after a murder. Around 1080 Egeno II of Konradsburg kills Count Adalbert of Ballenstedt in battle, and takes the dwelling of the converted monastery Adalbert. Egenos' son, Burchard von Konradsburg became the monastery in a castle and called it Falkenstein. To date, the Falkenstein Castle is one of the most famous tourist attractions in the Harz Mountains, it is part of the tourist route Romanesque Road. The Palace houses a museum, but as an attraction for many visitors is the breeding of falcons and birds of prey demonstrations with these birds. In recent years, much of the halls of the palace were restored in original style. Among them especially interesting are the completely authentic cuisine, Knight's Hall and the chapel with its medieval frescoes. Falkenstein has a pleasant restaurant that offers traditional medieval food (Ritteressen). Moreover, Falkenstein was natural scenery in a few film productions.